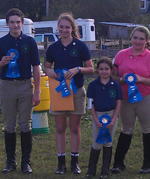 The NYUC Pony Club kids and parents have successfully arrived in Lexington, KY for Pony Club champs competition! This is a Festival year which means the activities are all at the Kentucky Horse Park which is the home to United States Pony Club. 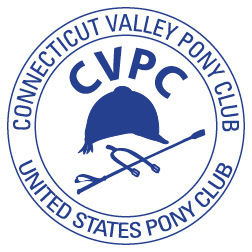 Best of luck to Nick Iarusso, Cailey Fay, Maya Norris and Fiona Lorenzen from CVPC and Captain Corrina McKelvey from SVPC who are competing as the NYUC Sr. Games team – The Flintstones! Gloria Norris from CVPC is also with the group as the horse manager for a Western Dressage team. Keep checking in for more updates as the weekend goes on, but we are rooting for them all from afar! Opening Ceremonies – can you find the regional blue in the stem of the “P”? Nick and Hank are old hands at Champs – they are looking ready! Inter-Regional Mounted Games Rally	FUN Mounted Games Day at Lord Creek Farm!